Darling is a progressive small town with a good infrastucture and everything necessary to cover your daily needs. The village has its own supermarkets, banks, ATMs, a pharmacy, clinic, doctors, schools and several churches. Explore the town on foot. Browse through the antiques and collectables and visit the interesting craft and gift shops. Enjoy a cup of coffee on the "stoep" of a coffee shop or at a farmstall. Linger a while and watch the locals go by. 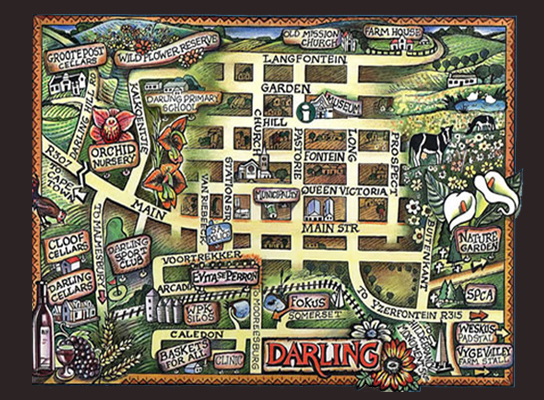 Some annual events are the Voorkamerfest (beginning of september), Darling Classic Music Festival (March) and the Darling Wildflower show (september). And don't forget to visit the interesting museum, around the corner of Tuinhuis, with lots of historic items of Darling's past!